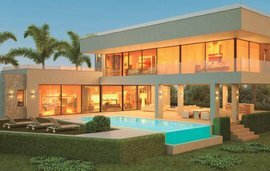 A magnificent home located in Sotogrande, a private estate considered to be one of the most prestigious and beautiful developments in Southern Spain. Communications to Sotogrande are now first class and the international airports of Gibraltar and Malaga are within easy reach. Its world class facilities include beach clubs, riding, polo, the marina and five golf courses including the world class clubs of Real Club de Golf Sotogrande and Valderrama. Situated in a unique position offering total privacy and tranquility, this villa enjoys uninterrupted views towards the Mediterranean Sea and the coast of Africa. Built to the highest specification the property consists of 5 bedrooms, 6 bathrooms, large drawing room and a separate large dining room. The high specification kitchen flows together and connects to one of the many outside dining areas and barbecue area. A large utility room is located to the left of the kitchen. There is also a TV room situated off the entrance hall. The entrance hall and sweeping staircase create an air of grandeur on arrival. The large bedrooms each have a unique view and offer total privacy. The villa is connected to ´The Folly´ a beautiful additional house that hosts a library, games room and office that would rival many Gentlemen´s clubs. Along with a wine cellar that would be the envy of many top class restaurants. Handcrafted exceptionally built cupboards constructed in exotic rare wood are a wonderful feature of the library and games room, as well as the Bang and Olufsen surround sound and drop down cinema screen. The house was built on three plots and is ring fenced by an additional five plots to ensure the views are never lost. Various terraces extend to an impeccable formal garden; which boasts many mature fruit and pine trees, the garden has several levels creating a feeling of privacy. The carriage driveway sweeps around the house allowing for easy access and parking for many vehicles. The swimming pool is chlorine free, heated with an optional salt-water system with a pool house and gymnasium. The garage has parking for two vehicles and various covered areas offer additional parking. There is also a separate garage for the golf cart. 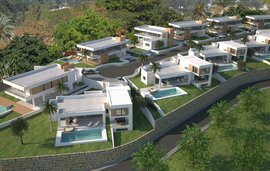 This is an incredible opportunity to purchase one of the most desirable homes within Sotogrande an area renowned for its exclusivity.